The S&P recently tumbled 19.8% before finding its legs — coming within an ace of the official 20% defining a bear market. Bet let us declare it a bear market and have done. Based on history’s telling, when can you expect stocks to recapture their early October 2018 highs? 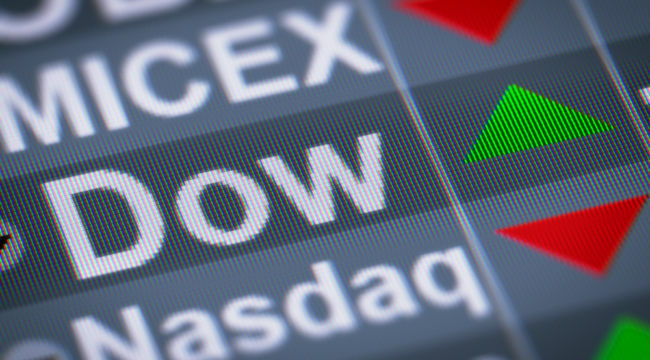 The Dow Jones marched 164 points forward today. The S&P added 20; the Nasdaq, 49. Meantime, we see today that Daily Reckoning associate John Mauldin is lacing into the Federal Reserve. Scientific incompetence — conducting a “two-variable” experiment. That is, for raising interest rates while simultaneously trimming its balance sheet. Do one. Or do the other. If you have two variables and something happens — either good or bad — you don’t know which variable caused it. A remarkable achievement, if true. It is a line already stretching horizon to horizon. But we suspect Mauldin has hooked onto something here. The fed funds rate — whose range the Federal Reserve’s “Open Market” Committee establishes — stands presently between 2.25% and 2.50%. But when combined with quantitative tightening, the “true” federal funds rate may approach 5%… or double the official rate. In other words,[it is] equivalent to the Fed undertaking around 20 rate hikes rather than the nine it has so far implemented this cycle. Twenty rate hikes since December ’15! How can it fail to leave its impact? We have further suggested that the fed funds rate may now have crossed the “neutral rate” of interest. Above the neutral line rates no longer offer economic support. Nor do they merely hold the scales even. They instead form an active drag. Meantime, global liquidity is evaporating before our eyes… like a puddle in the searing equatorial sun. Global central banks heaved forth some $2.7 trillion of credit growth in 2017. Global credit contracted $410 billion. 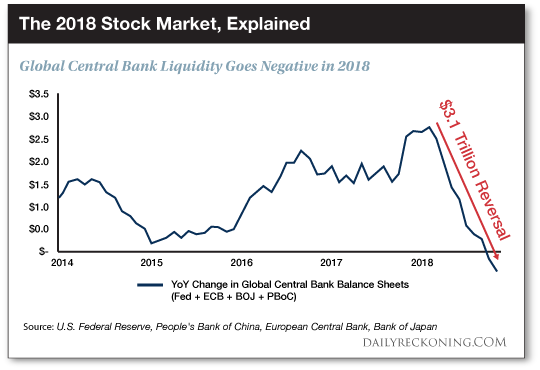 Never before in history, Atlas Research reminds us, has the world witnessed a $3.1 trillion reversal in central bank liquidity. Do you require further explanation for the market’s negative returns last year? Or for the bear market October–December? No one should therefore be surprised to find the global economy going backward. Chinese exports have plunged to two-year lows. Imports are also reversing. Export powerhouse Germany is now reporting its steepest industrial decline in a decade. The world has almost certainly sunk into recession if we take industrial growth as a thermometer of global economic health. The so-called Organisation for Economic Cooperation and Development (OECD) runs its own economic health diagnostic. Its composite leading indicator ran to 99.3 in November (the most recent available data). The December number will likely dip beneath 99.3. For 50 years running, we learn from Reuters, the United States has entered recession whenever the index slips below 99.3. The roster includes 1970, 1974, 1980, 1981, 1990, 2001 — and 2008. 1998 supplied the lone exception. But to return to our original question — how long must you wait before the stock market makes good its 20% losses? The answer assumes added significance the nearer you come to retirement. Assume the recent bear market knocked you back 20%. Must you wait up to six years to merely catch up? Or perhaps you are already retired and things are tight. Must you now confront the nightmare reality of running out of money? An Allianz Life survey reveals retirees fear going broke more than death itself. 61% to 39% they preferred the grave to the gutter. Stretching back to 1900, financial journalist Mark Hulbert ran the numbers through his mill… in search of light. He took account for dividends and inflation to give the truest reading. What was the final answer? Not 11.4 months, that is — but not 5.7 years either. If the historical average holds, the stock market will attain new heights in December 2021. But examine the median recovery, says Hulbert — “such that half of the bear market recoveries were shorter and half longer” — and a brighter image emerges. The median recovery period is 1.9 years… putting the market at new heights next September. But statistics are lovely liars. The market may recover quicker yet… or slower yet. We suspect slower as we gaze out upon the gathering gloom. Recall, the Federal Reserve is executing “decidedly the stupidest monetary policy mistake” in its history. Recall further that global liquidity is in deep contraction. Recall further still that leading economic data suggest the world is sinking into recession. But we concede… we have no answer. Veritatem dies aperit, said the Roman Seneca — time reveals truth. Time — only time — will tell.